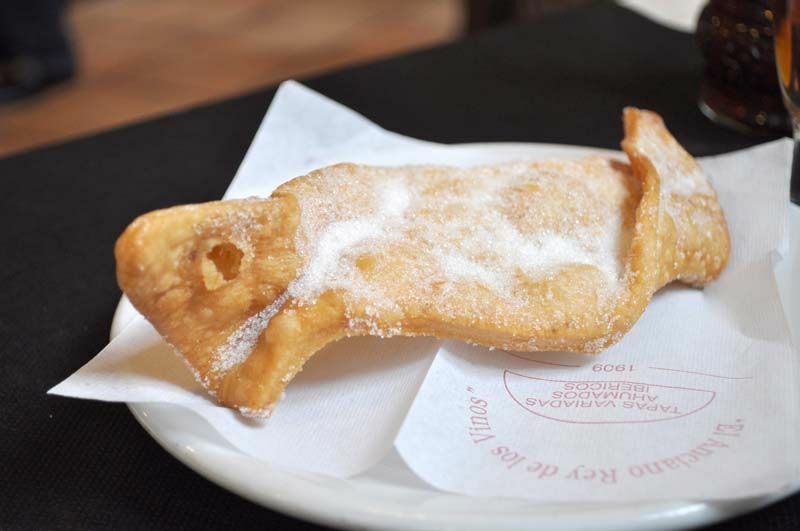 One of the typical sweets to taste in Madrid are the pestiños. His story is very old. In classical Rome a similar sweet was made that was taken in the Saturnalias. They were called “frictilia”, and were cooked with wheat flour, fried in lard and bathed in honey. But the most certain thing is that the recipe of what we know as pestiños, is the result of the influence of three cultures that have populated Spain: Christian, Jewish and Muslim. In the Sephardic kitchen there is an ancestor of the pestiño: the fijuelas. They are made with fried flour and bathed in syrup. They are still being prepared in some rural areas of Castilla y Aragón during Holy Week. In fact they are more known by the name of “flakes of La Mancha”. Since the Sephardim were expelled from Spain in 1492, the origin of this recipe can be placed before that date. But the recipe of pestiño as we know it today dates from the sixteenth century. In “La Lozana Andaluza” by Francisco Delicado (1528), it is indicated that one of the specialties of the protagonist was to make pestiños. On the other hand Cervantes also refers to the pestiños in “El Quijote” and in other novels, and in 1874 in “El sombrero de tres picos” by Pedro Antonio de Alarcón, he also refers to them as the delicacy that the miller offered to the illustrious guests who visited his mill during Easter. But to know well what a pestiño is, the best thing is that you come to El Anciano Rey de los Vinos, where you can take some pestiños artisans of the best quality. And if you accompany them with our sweet wine it will be difficult for you to resist repeating.